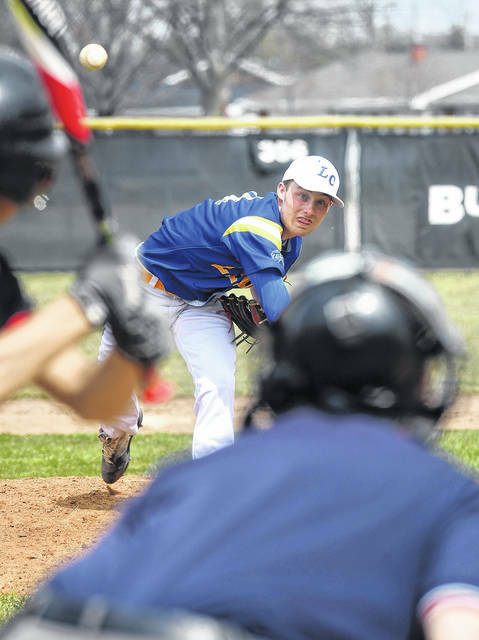 Lehman Catholic pitcher Drew Barhorst fires a strike during a nonconference game on Saturday in Covington. Covington first baseman Wes Gooding tales the throw just ahead of Lehman Catholic’s Bradly Haynes during a nonconference game on Saturday in Covington. 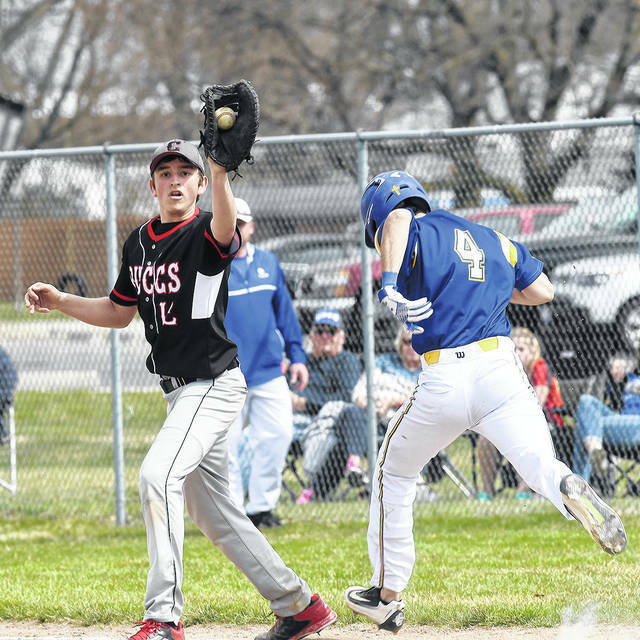 Covington second baseman Colton Francis throws a Lehman Catholic runner out at first base during a nonconference game on Saturday in Covington. 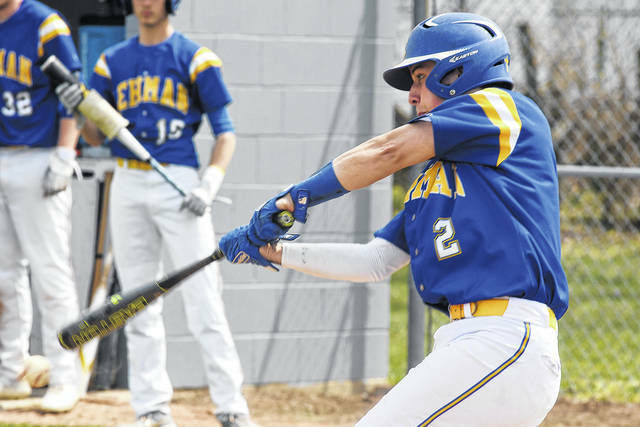 Lehman Catholic’s RJ Bertini takes a swing during a nonconference game on Saturday in Covington. Lehman Catholic improved to 6-1. Covington dropped 2-5-1, already double its win total from a year ago. Cooper Jay started things in the first with a single and was forced out at second on Gavin McReynolds’ fielder’s choice. Trentin Alexander was hit by a pitch and Cooper Jay walked. 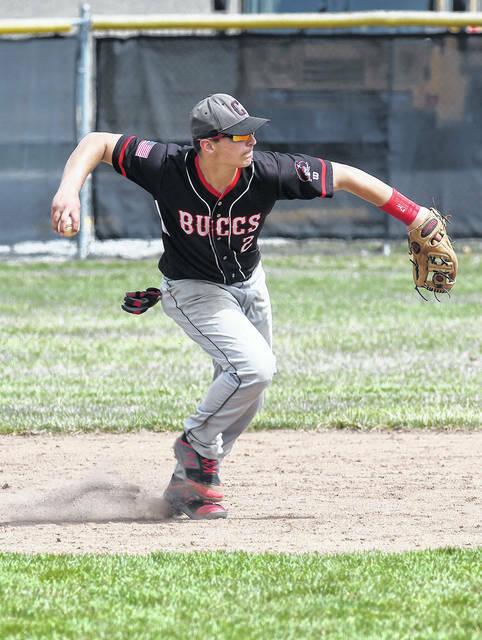 Jakob Hamilton followed by delivering a two-out, two-run single to get the Buccs on the board. After Gooding the first two batters, Lehman would draw four straight walks to force in the go-ahead run. Gooding walked Potts and Barhorst. Colton Francis replaced him and walked Bryce Kennedy and Bertini to put Lehman up 4-3. Francis walked Magoteaux to start the inning, bringing Hamilton in to finish the inning. Seth Roe ran for Magoteaux and with two-outs, Mitchell Sollmann drilled the ball through the right side for a RBI single to make it 5-3. But he was happy to escape Covington with a win against a much-improved Buccs team.